This is by far my favourite thing at the Toronto Interior Design Show this weekend. I almost shouted EUREKA! when I saw it. Yes, as you might have guessed it's a radio, but this radio is very special. It's designed for people across the country who have their dials permanently set to CBC. As I type this I listen to the Sunday Edition on Radio One so I am one of those people. 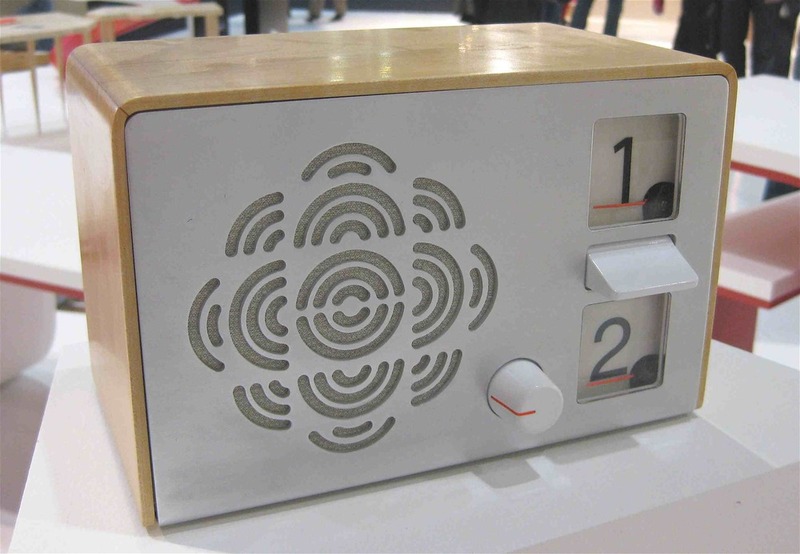 The design allows the listener to switch from CBC Radio One to Radio Two without enduring the static on the dial in between. This invention will promote marital harmony in my home. I am a Radio One gal, hubs is all Radio Two. Love the old school look, and the speaker grill that mimics the CBC logo. Thanks for inventing the obvious Tristan Zimmermann of Science and Sons -- and I mean that as the highest compliment. All of the best designs in the world are the product of one great mind thinking up the obvious then presenting it back to us -- eg the post-it note, the power of a cyclonic vaccum. Tristan is the great mind behind Plastidermy, Phonophone and the Lift Light -- a light that you dust by flying like a kite -- I mean come on, when have you heard of such a cool thing. NEVER! Learn more about his coolness here. 1. All CBC addicts unite and donate to the cause so that manufacture can begin. 2. All Canadian citizens pay a tiny extra bit of income tax so that Canada Citizenship and Immigration can present each new Canadian citizen with one of these radios as a little welcome to Canada gift. And maybe we can get The Bay to throw in a HBC signature collection scarf. Who's with me?